There has been considerable progress with self-healing polymers just lately, with the researchers dreaming of use in regular tyres and phones. However, analysts at IDTechEx have appraised the technology and potential commercialisation of triboelectrics, a new form of energy harvesting based on similar materials and think there is potential for partnerships. As for self-healing, researchers from the Harvard John A Paulson School of Engineering and Applied Sciences (SEAS) have developed a new type of rubber that is as tough as natural rubber but can also self-heal. The research is published in Advanced Materials. Self-healing materials are not new but engineering self-healing properties in dry materials – such as rubber – has proven more challenging. That is because rubber is made of polymers often connected by permanent, covalent bonds. While these bonds are very strong, they will never reconnect once broken. In order to make a rubber self-healable, the team needed to make the bonds connecting the polymers reversible, so that the bonds could break and reform. Cai, along with Jinrong Wu, a visiting professor from Sichuan University, China, and senior author David A Weitz, Mallinckrodt Professor of Physics and Applied Physics, developed a hybrid rubber with both covalent and reversible bonds. 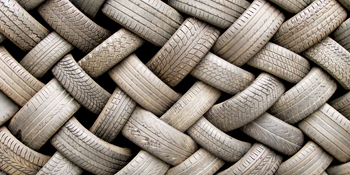 The self-healing ability is appealing for a wide variety of rubber products. “Imagine that we could use this material as one of the components to make a rubber tire,” said Wu. “If you have a cut through the tyre, this tyre wouldn›t have to be replaced right away. Instead, it would self-heal while driving enough to give you leeway to avoid dramatic damage,” he added. “There is still a lot more to do,” said Weitz. “For materials science, it is not fully understood why this hybrid rubber exhibits crazes when stretched. For engineering, the applications of the hybrid rubber that take advantage of its exceptional combination of optical transparency, toughness, and self-healing ability remain to be explored. Moreover, the concept of using molecular design to mix covalent and reversible bonds to create a homogenous hybrid elastomer is quite general and should enable development of tough, self-healing polymers of practical usage,” he added. In a parallel development announced late 2017, polyether-thioureas polymer glass was made to heal breaks when pressed together by hand without the need for high heat to melt the material. The research, published in Science, by researchers led by Professor Takuzo Aida from the University of Tokyo, promises healable glass that could potentially be used in phone screens and other fragile devices, which they say are an important challenge for sustainable societies. The researchers claim that the new material is the first hard substance of its kind that can be healed at room temperature. “High mechanical robustness and healing ability tend to be mutually exclusive,” wrote the researchers, saying that while some hard but healable materials have been developed, “in most cases, heating to high temperatures, on the order of 120-degC or more, to reorganise their cross-linked networks, is necessary for the fractured portions to repair. It is highly robust mechanically yet can readily be repaired by compression at fractured surfaces”. The properties of the polyether-thioureas glass were discovered by accident by student Yu Yanagisawa preparing the material as glue and finding that when the surface of the polymer was cut the edges would adhere to each other They healed to form a strong sheet after being manually compressed for 30 seconds at 21-degC, regaining original strength after two hours. He hopes it becomes a new environment-friendly material that avoids the need to be thrown away if broken.